JustCoding News: Outpatient is a free companion e-newsletter to JustCoding.com, the Web site that provides thorough explanations and in-depth analysis of medical conditions, diseases, treatments, and procedures. Register now for your free e-newsletter! JustCoding News: Outpatient and JustCoding News: Inpatient are the free companion e-newsletters to JustCoding.com, which provides thorough explanations and in-depth analyses of coding, billing, documentation improvement, and auditing. 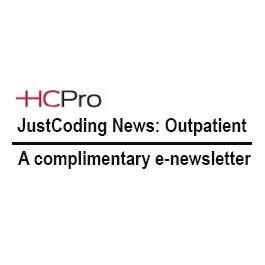 JustCoding News: Outpatient and JustCoding News: Inpatient alert readers to new articles posted on the site each week. The twice monthly e-newsletters contain one free article, a coding trivia question, a mini-poll, and new product alerts. These e-newsletters are written for coders, coding supervisors, clinical documentation improvement specialists, and HIM directors. For an in-depth look at the site’s features, see the Watch a Demo tab.